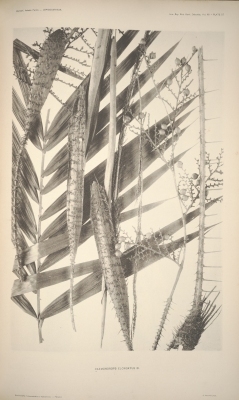 Daemonorops elongata is an evergreen, climbing palm, producing clusters of slender, unbranched stems, rarely more than 4 metres long, that scramble into the surrounding vegetation. The plant is harvested from the wild as a local source of material for thatching. Southeast Asia - Malaysia and Indonesia on the island of Borneo.